IS only controls a tiny enclave now. A few hundred IS fighters and their families are still holding out in Baghuz, under an intense siege by the US-backed Syrian Democratic Forces (SDF). The French Foreign Ministry says that "as for adult French nationals - jihadist fighters with Daesh [IS] - France's position remains unchanged: they must be tried on the territory where they committed their crimes - this is a matter of both justice and security". The five evacuated orphans will undergo a medical and psychological assessment, the ministry says. 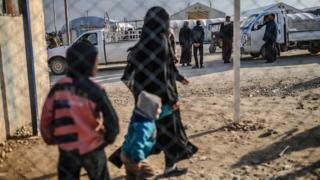 A French diplomat quoted by the AFP news agency said other children in a similar predicament could be repatriated "on a case-by-case basis", but no mothers would be allowed to accompany them. In France, relatives of French IS jihadists have been urging the government to repatriate such children, arguing that it is a humanitarian imperative and the children are not in war-torn Syria by choice. The UK is in a similar dilemma concerning jihadist mothers who want to return home. She did not renounce her allegiance to IS and the government removed her citizenship. There was much sympathy for her plight when her baby died this month.